Swansea's Gylfi Sigurdsson has been valued at £50m, Everton have spent £90m and Manchester United bought Romelu Lukaku for £75m - so is Newcastle boss Rafael Benitez right to call this summer's transfer window "a little bit crazy"? Premier League clubs' spending has already surpassed £500m since the end of last season - and business analysts Deloitte say they are on course to set another new record by 31 August. Teams spent a record £1.165bn last summer, rising to £1.38bn after the January window. Football finance expert Rob Wilson says the market "hyper-inflation" means anyone selling to an English club is adding "at least 40%, if not 50%, to the deal". And football agent Jon Smith says a £30m transfer - such as goalkeeper Jordan Pickford's move from Sunderland to Everton - is "the new norm". This week Deloitte released its annual football finances, which revealed record revenues of £3.6bn for Premier League clubs in 2015-16 - and that was the year before an improved TV broadcasting rights deal kicked in. It predicted that figure would be more like £4.5bn at the end of this coming season. Its report also said overall debt is falling and forecast the 20 clubs combined would return to profitability in the coming years. Is Rafa right - are prices 'crazy'? This transfer window comes a year after the new £5.136bn TV deal kicked in - a 71% rise on the £3bn negotiated in 2013. In the 2014 window - also one year after the previous broadcast deal was struck - Lukaku, then 21, was sold by Chelsea to Everton for £28m. The Belgian forward's move to Manchester United is for an initial £75m, which represents a 168% increase in value in three years. Also in 2014, Swansea signed Icelandic playmaker Sigurdsson from Tottenham for a reported £6.8m. The Welsh club now value the Leicester and Everton target at £50m - a 635% increase in value. "Revenues keep going up, predominantly because of the rise in broadcast rights values," said Chris Stenson, a senior consultant from Deloitte's sports business group. "Every Premier League club now has more money and are willing to spend that on players," he said. "It is the wealthiest league in the world and increasing its value makes it more attractive to sponsors and commercial partners. 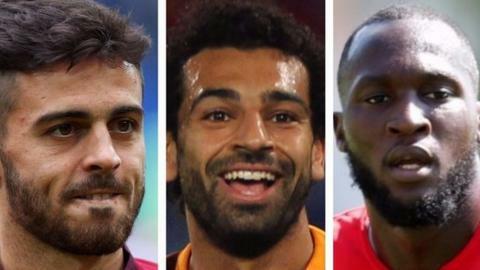 "So far we estimate Premier League clubs have spent about £500m in the transfer window, compared with £340m at the equivalent stage last year." In 2015, the Premier League sold television rights to its games for a record £5.136bn. The new three-year broadcast deal started for the 2016-17 season, with payments made throughout the campaign. The amount the Premier League shares out to clubs rose last season from a total of £1.64bn to £2.4bn. Bottom club Sunderland earned the same amount as the previous year's winners Leicester (£93m) while Chelsea received £150m, an increase of almost £60m on the previous 12 months. Is £30m becoming the norm? Once considered a landmark fee, £30m deals are now becoming more regular. There were 10 for at least that amount last summer, and already eight which could yield that much this time round. Pickford became the most expensive British keeper in history after Everton paid £25m - rising to what would be a club-record £30m - to sign the 23-year-old from Sunderland. Everton also spent £30m to bring in Michael Keane from Burnley. "There are players like him who would probably have been worth £12m a couple of years ago going for £30m," said Smith, formerly a players' agent. "£30m is a very big number, but it's become the norm." However Wilson, of Sheffield Hallam University, said it was unclear whether transfer values might still rise further over the next few years. "I can't see the value of the English deal increasing because Sky and BT Sport haven't picked up the subscription numbers they were hoping for," he said. "Logic therefore says the value of transfers won't rise over the next five years, although there is room for increased international TV rights packages."